Kamera skrivena u danas najprodavanijoj stvari na svijetu , punjacu , kao sto i sami znate kada krenete od sebe imate adaptere / punjace za mobitele , rutere , modeme i sve ostale raznovrsne stvari , ovog puta vam donosimo kvalitetan punjac u kojem je sakrivena kamera od 12Mega Pixela ! Kako bi vam odlicna slika bila zagarantirana , i kako bi u slucaju provale ili bilo kojem dr. slucaju bio potpuno siguran , jer vi mozete provjeriti sta se i kako se desilo kada god pozelite !! Deskripcija proizvodaca ispod - ukoliko trebate pomoc pri prevodenju javite mi se u privatne poruke ! - Special USB cord and records on a micro SD card hidden inside the device so only you have access to storage! - It can charge any phone including for Apple and Android. 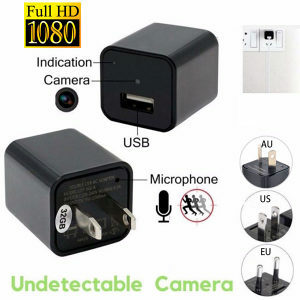 The completely undetectable hidden camera will have everyone thinking it’s just a plain phone charger! - The camera works right out of the box, doesn’t require any settings or special set up, and is super reliable and accurate. - This camera shoots at 1080p at 30 frames per second with a bit rate of approximately 24mbs. The camera even records clear audio at the same time! - No indicator light when recording, it can charge and take video at same time, If the internal memory fills up, the latest recordings will automatically overwrite the oldest files. - Operating system comes with or mainstream video player software. 1. Manual measuring, please allow 1 ~ 3mm ,thank you.